West Ham will decide whether or not to sign Samir Nasri next week, says manager Manuel Pellegrini. Injury-hit West Ham will make a decision over whether to sign Samir Nasri next week, says manager Manuel Pellegrini. 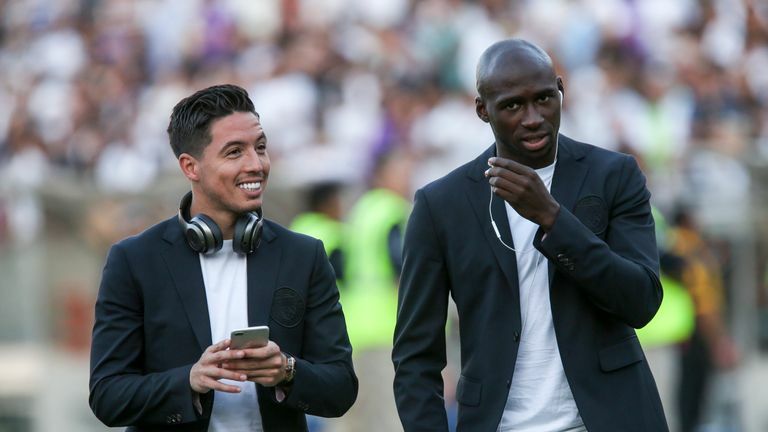 Nasri underwent a medical with the club in November, but West Ham were worried about how long it will take him to reach the required fitness levels to play in the Premier League after 18 months out. He was banned from football for breaching World Anti-Doping Agency (WADA) rules in 2016 after he visited an intravenous treatment centre in Los Angeles, but he can play again from January 1. Pellegrini allowed the France forward to train with the club and challenged the former Arsenal and Manchester City midfielder to lose weight in a bid to earn a contract. Speaking ahead of this weekend's game against Watford, which could see West Ham win their fifth-straight match and enter the top six, Pellegrini confirmed the club "are going to take the decision next week". "Samir is working with us very well, he is losing weight, his mentality is to try and have a spot here with the squad, so we will see in the next days," Pellegrini said. "Lucas Perez is able to at least be in the squad. All the other players continue with their injuries - Ryan Fredericks, Manuel Lanzini, Jack Wilshere, Andriy Yarmolenko." Jack Wilshere's comeback date remains uncertain, with Pellegrini saying the club would find out details over whether the player needs surgery on his latest ankle injury in the next couple of days. Marko Arnautovic will be back training with the team next week following a hamstring injury, but the likes of Javier Hernandez, Robert Snodgrass and Michail Antonio have stepped up in his absence. "When you don't have those players, you have a squad," said Pellegrini. "I am happy with the options I've had without Marko. I'm not happy with Marko's injury but I'm happy with my squad." Pellegrini admitted West Ham will need to spend in the January transfer window if they are to maintain their top-six challenge. He said: "We are happy with the squad but we know we need to replace players that probably won't play more this season - Carlos Sanchez, Andriy Yarmolenko." Transfer Talk: What next for Utd? Pellegrini refused to comment over specific players and said Besiktas midfielder Gary Medel was one of "25 players" being linked with the club. West Ham are interested in signing Medel, Sky Sports News has learned.